Back in early January of this year, IK Multimedia announced the iRig 2, one of three Android-compatible digital music interfaces announced by the company in recent months. While the first one -- the iRig HD-A -- is compatible exclusively with Samsung Professional Audio devices (Note 3/4, Galaxy S5/6/Edge), the iRig 2 is the first interface on the market that should support most Android 5.0 devices in some way or another. Today marks the public release of the iRig 2, and it's already available from retailers like Musician's Friend and Sweetwater Music, though Amazon shows that it's actually not available until March 30th. The iRig 2 comes a full five years after its predecessor, and brings with it a half-a-decade worth of changes, too. This version features a gain control, which allows musicians to tweak the sound of their instrument to always get the best sound. For example, a humbucker-equipped guitar may require less gain than something like an acoustic guitar to get the best results. It also features a new 1/4" amplifier output, which allows the unit to be used through a traditional guitar amp or powered speaker. And with the new FX/THRU switch, iRig 2 allows musicians to play live and use the iRig with their mobile device as a tuner or with a recording app to capture the dry signal. The iRig 2 is currently fully compatible with the Galaxy Note 3/4 and S5/6/Edge on the Android side, and other Android 5.0 devices are also supported but "can't do low-latency processing." I'm not exactly sure what that means (or what the iRig 2 can do on those devices), but I've reached out to IK Multimedia and will update when more information is available. It's worth noting that the iRig UA will be available at some point in the near future, which will be able to do full audio processing on Android 4.0+. You can pick an iRig 2 right now for $40. Just like its predecessor, the new iRig 2 plugs directly into the mini jack input of a mobile device. It lets musicians send an instrument signal to apps, such as IK's AmpliTube, while also providing on-board output for real-time monitoring. iRig 2 now comes with gain control, which lets users precisely adjust the input gain of their instrument to match their mobile device. This means that it can be customized to always provide the best sound, no matter what type of guitar, bass or line-level instrument or device is used. 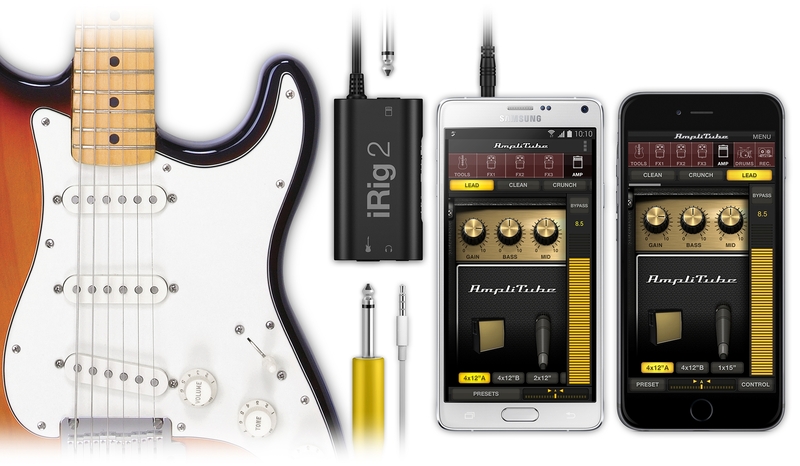 In other words, iRig 2 sounds just as good connecting a wailing humbucker electric guitar to an iPhone 6 as it does a jazzy archtop or mellow electric piano to a Samsung Galaxy Note 4.
iRig 2 now not only works with iPhone, iPad, iPod touch and Mac, but that it also supports the complete line of new Samsung Professional Audio devices. Using the Android version of AmpliTube, iRig 2 is fully compatible with Note 3, Note 4, Galaxy Edge, Galaxy S5 and also the forthcoming S6. Plus iRig 2 now also offers compatibility with Android 5 devices. As the most convenient way to bring a guitar signal into a mobile device, it lets musicians use the hundreds of available tuning and recording apps available, such as the forthcoming UltraTuner for Android. When it comes to playing live on stage or with a band, iRig 2 provides multiple new features that offer even more flexibility and integration than before. Its new 1/4" amplifier output, in addition to its traditional 1/8" headphone output, allows iRig 2 to be plugged directly into a guitar amplifier or powered speakers without an adaptor. This helps to keep all cable connections tidy and organized. A new FX/THRU switch allows iRig 2 to send either a wet or dry signal through the device. This means that guitarists can play live with an amplifier and use their mobile device with a tuner app, such as IK's UltraTuner, or a recording app, such as IK's iRig Recorder, to record a dry signal for further processing. iRig 2 also comes with a clip and a velcro strip so it can be firmly installed on a microphone stand, avoiding accidental disconnection. iRig 2 is ready to go right out of the box. It comes with a powerful cross-platform suite of apps and software that includes free versions of AmpliTube for iOS, Mac and Android Samsung Pro Audio. Galaxy Note 4, Galaxy Note Edge owners will receive AmpliTube LE for Samsung Pro Audio as a complementary download courtesy of the included Galaxy Gifts app bundle that comes with their mobile device. And while iRig 2 is made to pair with AmpliTube, it's also compatible with many other mobile music creation apps and utilities, such as Apple's GarageBand, Samsung's Soundcamp and literally thousands of others. The new iRig 2 interface is now available from select music and consumer electronics retailers worldwide, and from the IK Online Store, at the same price of the original iRig: Just $39.99 (excl. taxes).